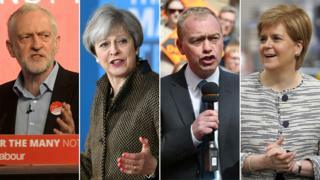 Most manifestos are not out yet - so, while we wait, here's a rundown of significant policy commitments made so far during the election campaign. It will be updated as new pledges are made. The Lib Dem manifesto will include a commitment to another EU referendum on the final Brexit deal, in which the party would campaign for Remain. Tim Farron has said campaigning against "hard" Brexit will be "front and centre" of the party's election campaign. The party says the UK should remain in the single market and a vote should take place on the "final deal" between the UK and the European Union. Labour's shadow Brexit Secretary Sir Keir Starmer has ruled out a second referendum, but said there would have to be transitional arrangements at the end of the two-year Article 50 process. He said Labour would prioritise trade with the EU; it might stay in the customs union; it would give EU citizens a unilateral guarantee that they could stay on in Britain, and replace the government's proposed Great Repeal Bill - which would scrap the 1972 European Communities Act and incorporate many existing EU laws applying to the UK into domestic law - with an EU Rights and Protections Bill. Conservative leader Theresa May has said the UK "cannot possibly" remain part of the single market as it would mean "not leaving the EU at all". She also says the UK must seek a new customs agreement as its current membership of the customs union prevents it from striking trade deals around the world. She says voters need to give a strong message that they back her to boost her UK's negotiating position in the talks with the rest of the EU. SNP leader Nicola Sturgeon has been pushing for Scotland - which voted to remain in the EU - to have a special status after Brexit, including remaining in the single market. She has called for a second independence referendum before the Brexit package has been finalised. The Green Party would offer a second referendum on the details of any Brexit deal, with 16 and 17-year-olds given a vote. Labour has pledged not to raise income tax for those earning less than £80,000 a year as part of an election "personal tax guarantee" for 95% of taxpayers - the top 5% of earners would pay more to fund public services. Recent cuts to capital gains tax would be reversed. VAT would not rise. The party plans to create one million new jobs by pumping £250bn directly into the economy over ten years. Another £100bn would be spent to set up a publicly-owned national investment bank, which would be expected to raise another £150bn. Banks would be required in law to keep high street branches open. Any company bidding for a public sector contract would be required to pay its own suppliers within 30 days, and fines might be introduced for private firms who persistently pay late. The Conservatives have ruled out a VAT rise. Theresa May has also said she has "no plans" to raise other taxes after the election, but has so far not repeated a 2015 pledge that also ruled out rises in income tax and National Insurance. There are plans to press ahead with increases to the effective Inheritance Tax threshold for married couples and civil partners to £1m, with a new transferable main residence allowance of £175,000 per person. This will be paid for by reducing the tax relief on pension contributions for people earning more than £150,000. The Lib Dems pledge to put 1p on income tax to pay for increased health spending. The money raised would primarily be invested in social care which will get £2bn a year, and care outside of hospital, mental health and public health. The married couples tax allowance abolished. The Green Party is expected to unveil plans to raise income tax for the better off, and changes to inheritance tax. Scotland has powers to set its own rate of income tax. However, SNP first minister Nicola Sturgeon has dismissed the idea of raising the top rate of income tax for those earning more than £150,000 from 45% to 50%, as has been proposed by Scottish Labour. Labour has pledged to raise corporation tax for larger businesses from its present rate of 19% to 26% by the end of the next parliament. Smaller firms with profits below £300,000 a year will see more modest rises - up to 21% by 2020-21. The party says it would raise billions of pounds for public services with a new tax on financial transactions - known as a "Robin Hood" tax. It has also warned BAE Systems it could lose future contracts under Labour unless its boss took a £7m pay cut. The Lib Dems would raise corporation tax to 20%. The Green Party is expected to unveil plans to raise corporation tax for big businesses. Jeremy Corbyn has said "all aspects" of defence would be reviewed if Labour won power. Military action would only be taken as a last resort. The UK would pursue an independent foreign policy, and would not "hand hold" US president Donald Trump. Corbyn would appoint a minister for peace. The Lib Dems would "maintain a credible nuclear deterrent", but Tim Farron has advocated replacing the current system of continuous-at-sea deterrence with more irregular patrolling patterns. The party would give graduates in technical and engineering subjects £10,000 to join the armed forces, under plans to tackle recruitment problems. It also pledged to keep defence spending at the Nato benchmark of 2% of national income. There is no indication that the Conservatives are about to abandon their commitment to go ahead with building replacements for the UK's Vanguard fleet of four submarines carrying Trident nuclear missiles. The Conservatives will once again aim to cut net migration to the "tens of thousands" in their election manifesto. The target, set by David Cameron in 2010, has so far not been met. Labour says it accepts that the principle of the free movement of people - which EU leaders say goes hand-in-hand with single market membership - would have to end after Brexit but that new immigration controls should not be the "overarching priority" as the UK leaves. For the Lib Dems, Tim Farron has said fixed migration target hurt UK businesses, hospitals and universities. UKIP say they would cut net migration levels to zero within five years by almost halving immigration into the UK. They want to align the number of people coming to the UK with those leaving. Unskilled and low-skilled labour would be banned for five years while skilled workers and students would need visas. Labour says it will spend an extra £37bn on the NHS in England over the next five years if it wins power. This would include £10bn on upgrading IT systems and repairing buildings, would be funded by tax increases and capital borrowing. The party also plans to ban adverts for junk food and sweets from all TV shows broadcast before 9pm as part of a planned child health bill to tackle childhood obesity. The aim is to halve the number of overweight youngsters within 10 years, and cut the £6bn annual cost to the NHS of obesity. Public health budgets would be ring-fenced to allow councils to invest in leisure activities and health awareness campaigns. A planned programme of hospital services closures would be suspended across England, the current 1% cap on pay rises for NHS workers would be scrapped, tuition free for student nurses and midwives would be protected, and safe NHS staffing levels enshrined in law. Car parking charges at NHS England hospitals would be scrapped by raising insurance tax on private healthcare to 20%. The Conservatives' childhood obesity plan announced last August set out the action local communities, the food industry, schools and the NHS should be taking over the next 10 years. The 1983 Mental Health Act would be replaced with new laws tackling "unnecessary detention" in England and Wales, and 10,000 more NHS mental health staff recruited in England by 2020. The Lib Dems support the introduction of a regulated cannabis market in the UK, arguing legalising and regulating cannabis delivers significant benefits to public health and takes pressure off the criminal justice system. They would ensure access to HIV prevention drug Pre-Exposure Prophylaxis (PrEP) on the NHS for people in high-risk groups. The Green Party would remove the involvement of the private sector in the health service, and increase spending. It would match mental health spending to the amount spent on physical health. The Women's Equality Party would introduce a right to paid leave for carers. Labour would spend £4.8bn a year to keep up with rising costs and £335m so no school loses from a funding overhaul, to be paid for by corporation tax rises. There are also plans to extend free school meals to all primary school pupils in England, proposing that the cost would be covered by introducing VAT on private school fees. Scrapped Education Maintenance Allowance grants would be reinstated. These were means-tested payments of between £10 and £30 per week intended to encourage 16- to 18-year-olds to stay in sixth forms and further education colleges. Labour would also boost adult education, making some free courses available, and fund an "arts pupil premium" for primary schools. It is believed the party's manifesto could make the abolition of tuition fees for higher education a goal. The Lib Dems would spend £7bn to protect per-pupil funding, to be partly funded by staying in the EU single market. The Green Party would scrap tuition fees, and reinstate the Education Maintenance Allowance grant. UKIP would block the opening of new Muslim schools until, it says, more progress has been made integrating Muslims into mainstream society, and close any school where there i­s evidence of Islamis­t ideology being taug­ht or imposed on chil­dren. Theresa May has said a Conservative government would not scrap university tuition fees in England. The SNP is to increase the budget of head teachers in Scotland by £120m to invest in measures it believes would improve levels of literacy and numeracy. The Lib Dems have pledged to protect the "triple lock" on state pensions. This guarantee, introduced by the 2010 coalition government, sees the state pension rise in line with wages, inflation or by 2.5% - whichever is highest. The party would scrap annual winter fuel payments for retired people in the 40% tax bracket to pay for it. Labour has also pledge to retain the "triple lock". It would also amend company takeover rules to protect employees' pensions. Theresa May has declined opportunities to confirm the Conservatives would guarantee the "triple lock", so far. The Tories have pledged to increase the powers of regulators over company pensions, including fines for employers who deliberately underfund schemes. Labour has pledged to recruit 10,000 new police officers in England and Wales. The Lib Dems plan a move away from short sentences, which they claim are ineffective, to non-custodial alternatives. The Lib Dems would introduce a month's paid parental leave for fathers. The Women's Equality Party is offering free childcare. The Conservatives have ruled out a rethink on the current system for restricting child benefit for people earning over £50,000. The Conservatives are promising a "new generation" of social housing in England, funded by £1.4bn already set aside for infrastructure spending. The plans involve offering "fixed term" council houses to be sold off after 10 to 15 years, with any proceeds reinvested in social housing. Labour would build a million new homes over five years. Half would be council and housing association homes which would be "for rent and totally affordable". There would also be new legal standards for rented homes, with landlords who fail to meet minimum standards facing fines of up to £100,000. The Lib Dems would introduce a Housing Investment Bank to generate funding for new homes. The Green Party would introduce rent controls, build 500,000 socially-rented affordable homes and introduce a Landlord Licensing Scheme to ensure that every landlord must adhere to minimum standards. The Conservatives have promised the biggest expansion of workers' rights under their leadership, with pledges to keep all workers' rights currently guaranteed by EU law, put worker representation on company boards and protect pensions. There would also be a statutory right to a year's unpaid leave to care for a relative. Labour has a 20-point plan to end the "rigged economy" in the workplace, which includes giving all workers equal rights from day one, a ban on zero-hours contracts; guaranteeing trade unions a right to access workplaces, ending the public sector pay cap, raising the minimum wage, banning unpaid internships, abolishing employment tribunal fees, and increasing and extending paternity pay. It also plans to introduce a "real living wage" of at least £10 an hour, and to introduce four new UK-wide bank holidays. The Lib Dems plan to introduce mandatory reporting on the ethnicity pay gap for organisations with 250 employees or more. The party has pledged to scrap the public sector pay cap, which limits pay rises for workers to 1% per year until 2020. Labour plans to reduce the number of people sleeping rough by doubling the number of homes available for use by homeless people. Four thousand new flats and homes would be ring-fenced for rough sleepers in cities such as Bristol, Liverpool and Birmingham. The carer's allowance would be increased by an extra £10 a week - a 17% increase. The two-child limit on child benefit would be scrapped. The Winter Fuel Allowance and free bus passes for pensioners would be retained. The Lib Dems want to end rough sleeping in Britain by placing long-term homeless people straight into independent homes rather than emergency shelters, and increasing grants to local authorities to fund homelessness prevention services more effectively. The party would also reverse cuts to universal credit, and abolish the work capability assessment. The party would also introduce civil partnerships for heterosexual couples. UKIP would ban Sharia courts and the wearing of face coverings in public places, which it argues are "a deliberate barrier to integration and in many contexts, a security risk too". It would also introduce annual school-base­d medical checks on g­irls from groups at h­igh risk of suffering­ female genital mutilation. The Conservatives plan a cap on gas and electricity bills for households that pay standard variable tariffs. Analysis: How might an energy cap work? Theresa May has ruled out cuts to the UK foreign aid budget under the Conservatives, saying the commitment to spending 0.7% of national income on aid "will remain". The Lib Dems would replace the first-past-the-post electoral system with a proportional voting system, extend the vote to 16 and 17-year-olds, and introduce a democratically-elected upper chamber. The Green Party would also extend the vote to 16-year-olds. The Conservatives have ruled out lowering the voting age at UK elections, with Theresa May saying this is one of those questions "where you have to draw a line". UKIP want postal voting on demand to be scrapped, with applicants having to demonstrate a genuine need before a postal vote is granted. The Green Party would ban fracking, scrap plans for all new nuclear power stations, including Hinkley Point C, create a Green Investment and Innovation Centre to help secure finance for a transition to a low-carbon economy, set up an energy system with progressive tariffs so people who use less energy pay less per unit than the big consumers, retro-fit insulation to nine million homes, and encourage local communities to create energy and municipal heating projects. The Green Party would introduce a new Clean Act, an Environmental Protection Act to safeguard EU laws that protect British nature, wildlife and countryside, a diesel scrappage scheme, a strengthened Clean Air Zone network across the country, a levy on emissions-cheating car manufacturers and a bottle deposit scheme to stop 16 million plastic bottles ending up in the environment every day. The Lib Dems would clamp down on illegal imports of pets and introduce mandatory licensing of puppy breeding.